I Place in Road race, I place in Rink race In CBSE South zone skating competition held at Belgaum, Kanataka . 1st Place in Road race and 1st Place in Rink race in CBSE National Level Skating Competition held at Vihar, Mumbai. The Scouts of The Oxford Senior Secondary School, participated in the 22nd World Scouts Jambureewhich was held at Sweden from 27th July to 8th August 2011. 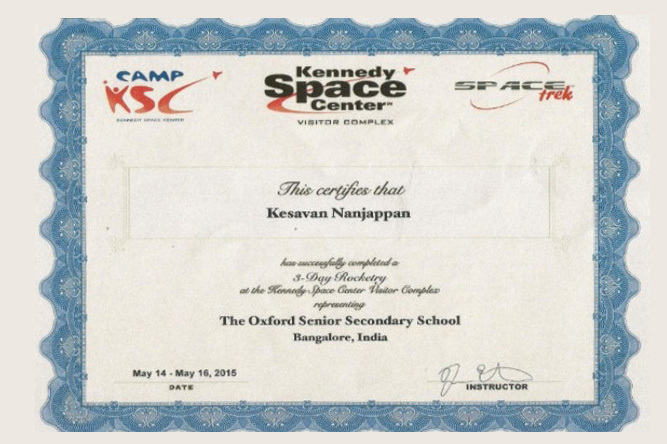 4 Scouts accompanied by the Scout Master Mr.Riyaz Pasha represented our school amongst the 176 countries present. 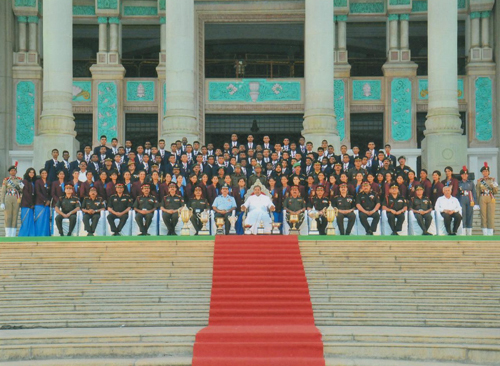 Manoj.V.OF CLASS XII received Rashtrapati Award from the President of India, Pratibhapatil at RashtrapatiBhavan in New Delhi on August 23rd 2011. 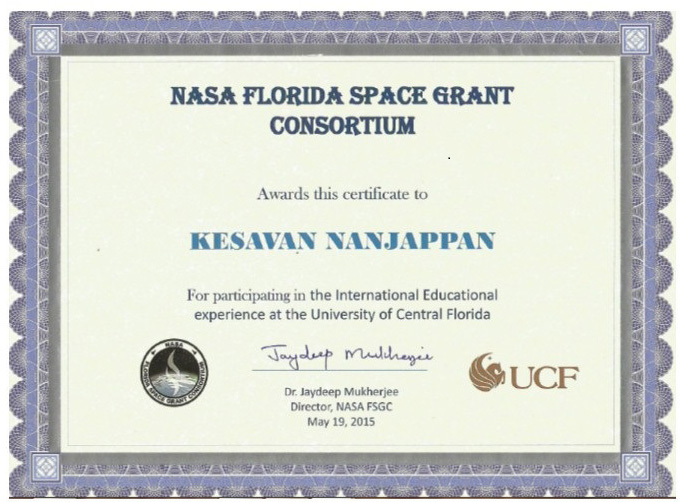 He was the 23rd student from our school to receive this prestigious award. 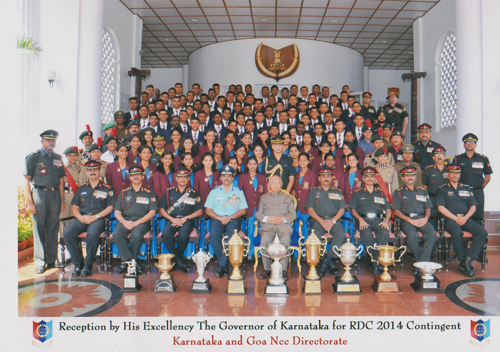 In the year 2011-2012, Akash.G, Class X of Scouts and Niswana,Class X of Guides received Governor Award. 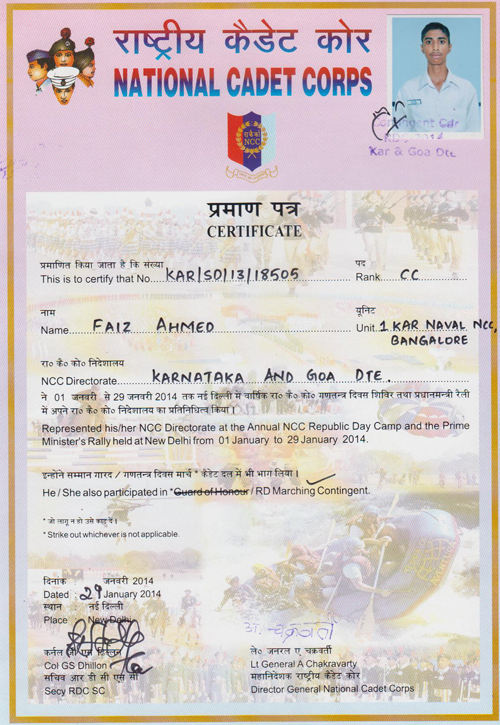 In the year 2011- 2012--- Keshavkumar of IX A (NCC cadet) bagged gold medal in firing. Aarohi R Bhide & M.S.Subbaiah have been selected to represent the school in the CBSE National Skating competition to be held at Virar, Mumbai in the month of December 2013. Raj Vinayak of Std.IV, a State level swimmer has won many medals to his credit. 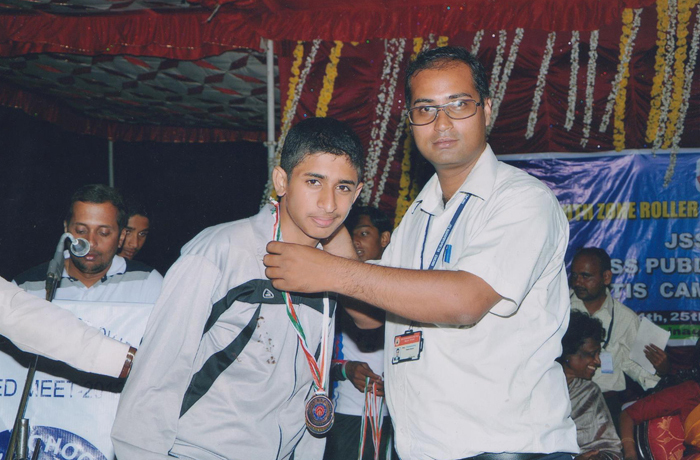 In the year 2011-2012, Raj Vinayak of IV Std won the State level Swimming competition. Chirag.P.Venkat won 3 Gold medals in International level conducted in Nepal. 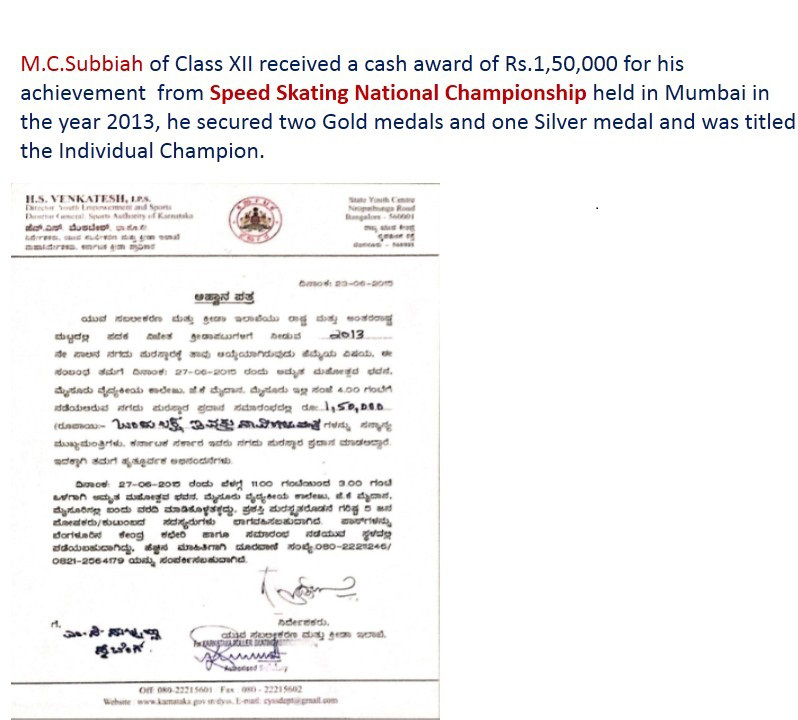 M.S.Subbaiah won 1 gold medal, 1 bronze medal, CBSE selection trails in Mysore. 2 gold medals, 1 silver medal in state level skating competition held in Bangalore and won Individual Championship. 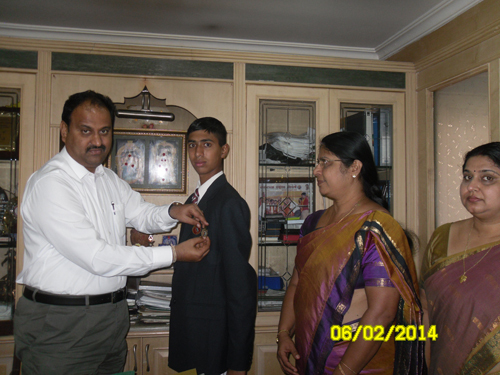 Chirag.P.Venkat won 2 Gold medals, 1 bronze medal inNational level conducted by OSSKAI. The students participated in CBSE Athletic Meet held in Tirupathi, Andra Pradesh in the month of October (2011-12). Our School students participated in CBSE South zone cluster VII, Inter school foot ball tournament(2012-13) which was held at B.G.S International Residential School Bangalore. In the year 2011-2012, Haripriya of Class XI secured II Place in State Level Tournament conducted by Karnataka Table Tennis Association. Her overall state rank is 4 for past 3 years. She represented Karnataka in National Level Tournament. 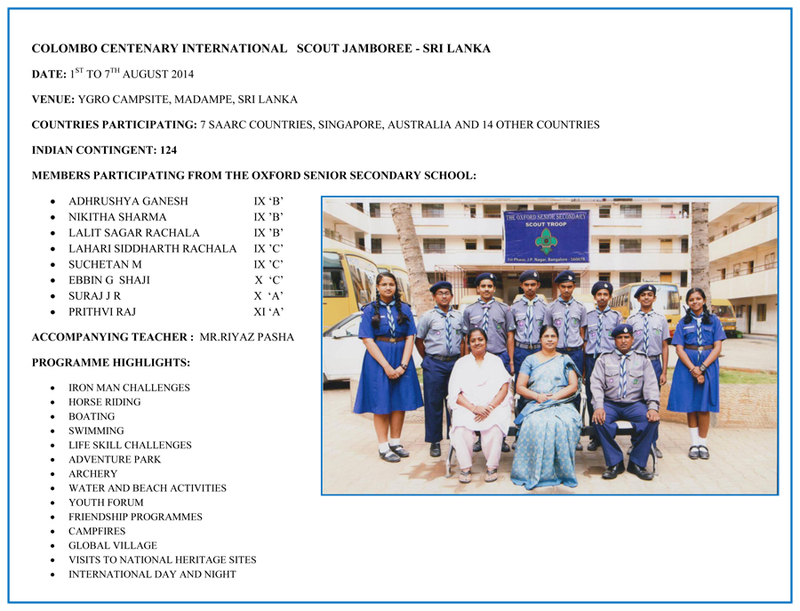 The students of The Oxford Senior Secondary School to be a part of 22nd World Scout Jamboree form 27th July, 2011 to 7th August, 2011 at Sweden. Aditya Srinidhi, D.Lingeswara, Rohith D.S. 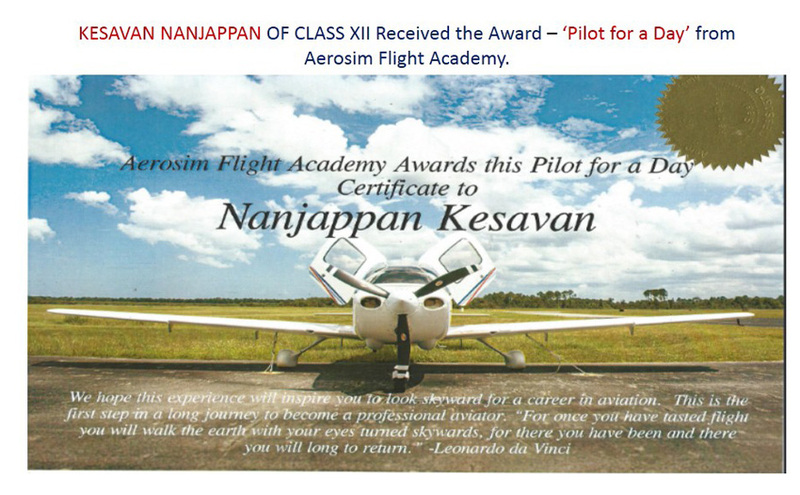 and Manoj V. will be accompanied by the Scouts Master Mr.Riyaz Pasha. Students will be trained for Patrol Activities for Physical and Intellectual Challenges. A number of events on Environmental Issues will form an integral part of the camp. The Jamboree encompasses the programmes on Cross-Cultural exchanges for better understanding of “World as a united family”. 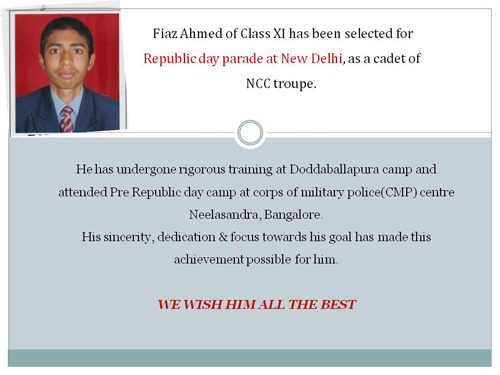 The Oxford Scout Troop has been selected to represent Bharat Scouts and Guides in the Independence Day Parade 2011, to be held at Manik Shaw Parade Ground, M.G.Road, Bangalore. Combined Annual Training Camp – III / Group ‘A’ TSC Training Camp 2011-2012 was held at JP Narayan National Youth Centre, Vidyanagar, from 9th July to 18th July 2011. Keshav Kumar.S, Aidtya B.A., Apurv.P.Joshi, Navneeth Singh and Sai Akhil Imturi of Class VIII attended the camp and won many prizes. Sai Hari Chandana of Std XI, Sai Hari Priya of Std VII, Amrutha Varshini of Std VIII have won Runner Up Trophy . G.Yashaswini of Std X won II Prize – under 16 category, and selected for National Level Swimming Competition. Srika.K.Raju of Std Vii got III Place – under 14 category. Aarohi R Bidde of Class VII Std won II Place in Skating. Shashwat, Ebbin, Rashida, Chirag and Nihal of Primary Section have bee awarded with Bal Kala Ratna Award.